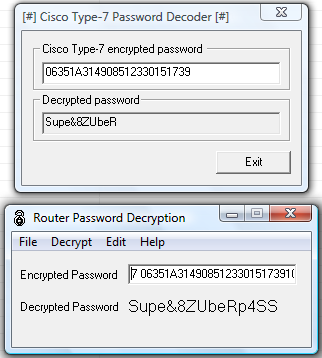 Cisco's PIX password encryption is a base64 encoded MD5 hashsum, using only one MD5 update (no salting or anything). This also permits for cryptanalysis attacks using rainbow tables to speed up the process. 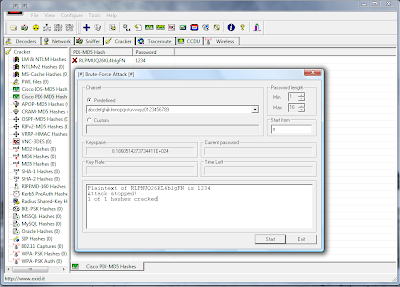 Also, note that MD5 has know weaknesses in the algorithm, that may allow for more complex password cracking attacks. Also, if you're using a "type 7" password, that's pretty much useless, since it can get cracked instantly. People can just use simple tools such as Cain and Abel, or Solarwinds Router Password Decryption to reverse the crypto on type 7 passwords. IOS type 5 passwords (MD5 using 1000 rounds) is more complex, and harder to crack, but yous still shouldn't paste your hashes for everyone to see... Remember, even with type 5 passwords, you're still vulnerable to dictionary attacks, hybrid attacks, rainbow table attacks (PIX only), md5 repository attacks, or plain old password guessing. If you're going to paste your config files anywhere, use the "show tech-support" command available in newer IOS versions. It gives more info, and strips confidential information, password hashes and such.